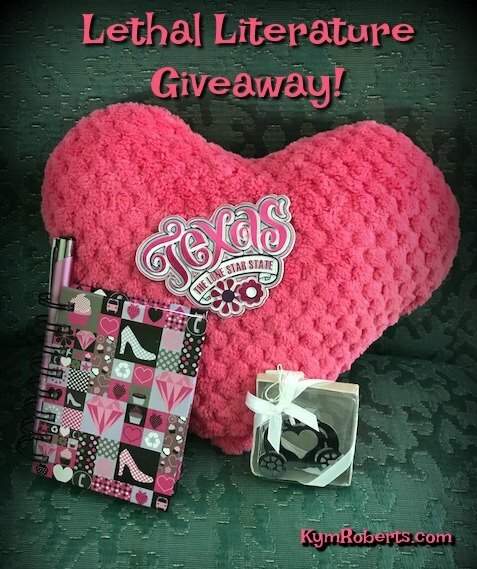 Details on how to win an ebook copy of this book, along with a special giveaway from Kym shown in the photo just above the giveaway info, at the end of the review, & there are links to purchase it. Although the death of her mother from cancer destroyed Charli Rae Warren, she truly hopes that her father Bobby Ray can move on to find love again. It’s unfortunate that he seems to have such horrible luck with girlfriends; namely that they end up dead with Bobby Ray being the primary suspect. It seems to have improbably happened for the second time, not long after Charli encounters Ava James doing a Walk of Shame from Bobby Ray’s home. Charli is determined that her father not be linked to the murder, especially after learning that Alzheimer-suffering Isla Sperry had accused her own husband of having an affair with Ava. Charli has always had an acrimonious relationship with the former sheriff, but even she has her doubts that the bible-quoting Judge Jacob Sperry would stray so far off the righteous path. Ever since returning to Hazel Rock, Texas, Charli has been leery with her own romantic prospects after the traumatic way she fled. Her ex-boyfriend, Mayor Cade Calloway, appears to have made a political career his priority, so Charli is finally taking the first steps towards a weekend getaway with Sheriff Mateo Espinosa. In light of the ongoing murder investigation and Mateo’s opinion on Charli’s involvement, it looks as though love isn’t in the future for either Warren family member. Leading the charge in Charli’s investigation is her best friend Scarlet, who speaks in Millennial acronyms yet displays the bravery and generosity of one far beyond her years. 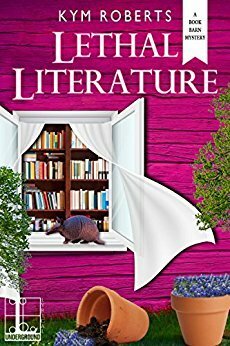 Further delighting readers will be Pink armadillo Princess, who proves to be the ultimate heroine in an edge-of-the-seat, yet still hilarious, conclusion. Since the debut of Fatal Fiction, this series has slowly unraveled the complicated history that caused Charli to flee her hometown and vow never to return. While the truths she learns about her life are shocking, perhaps even more devastating are those who kept the secrets hidden. Seeing bi-racial Charli mend relationships and form new ones is so rewarding, and many relate with her struggle to move past childhood traumas and accept new realities. Even more relatable is the love of reading that has always soothed her, as even while away from her beloved Book Barn Princess, she shares and encourages her affection with the printed word through a literacy book drive. Serious contemporary topics are blended perfectly with humorous Texas flavor, and seeing Charli rediscover her love for the town and people of Hazel Rock is a genuinely heart-warming experience. To enter to win an ebook copy of Lethal Literature, along with the special extras in the photo above from Kym, simply email KRL at krlcontests@gmail[dot]com by replacing the [dot] with a period, and with the subject line “lethal,” or comment on this article. A winner will be chosen June 2, 2018. U.S. residents only. If entering via comment please be sure to include your email address. This is a new author to me. Would really like to read "Lethal Literature". New author to me. Would really like to read "Lethal Literature". Would love to read this book. Thanks for the chance to win!